John Marty Stuart is an American country music singer-songwriter, known for both his traditional style, and eclectic merging of rockabilly, honky tonk, and traditional country music. In the early 1990s, he had a string of country hits. Ghost Train: The Studio B Sessions is the 17th studio album of country music singer Marty Stuart. The album was long-awaited by fans of Stuart, as most of the songs had already featured on The Marty Stuart Show, Stuart's country/bluegrass show on RFD-TV. It was recorded in the historic RCA Studio B in Nashville, which was being used by the Country Music Hall of Fame as a type of museum until Marty asked to use the "Home of a Thousand Hits" to record 'Ghost Train'. Steven Noel Wariner is an American country music singer, songwriter and guitarist. He has released eighteen studio albums, including six on MCA Records, and three each on RCA Records, Arista Records and Capitol Records. He has also charted more than fifty singles on the Billboard country singles charts, including ten Number One hits: "All Roads Lead to You", "Some Fools Never Learn", "You Can Dream of Me", "Life's Highway", "Small Town Girl", "The Weekend", "Lynda", "Where Did I Go Wrong", and "I Got Dreams", and "What If I Said", a duet with Anita Cochran from her album Back to You. Three of his studio albums have been certified gold by the Recording Industry Association of America for shipping 500,000 copies in the United States. John Richard Jorgenson is an American musician. Although best known for his guitar work with bands such as the Desert Rose Band and The Hellecasters, he is also proficient on the mandolin, mandocello, Dobro, pedal steel guitar, piano, upright bass, clarinet, bassoon, and saxophone. While a member of the Desert Rose Band, he won the Academy of Country Music's "Guitarist of the Year" award three consecutive years. Albert William Lee is an English guitarist known for his fingerstyle and hybrid picking technique. Lee has worked, both in the studio and on tour, with many famous musicians from a wide range of genres. He has also maintained a solo career and is a noted composer and musical director. Brent Mason is an American studio session guitarist and occasional songwriter. He is known primarily for his work in the field of country music. In addition to releasing two instrumental studio albums, he holds several credits as a songwriter. He is a Grammy Award winner (2008) and a two-time winner of the CMA Award Musician of the Year. He has released two albums and has produced a number of artists. 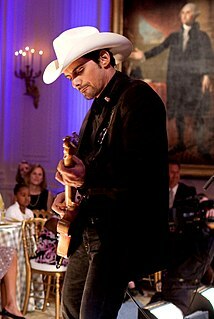 Brad Douglas Paisley is an American country music singer and songwriter. Starting with his 1999 debut album Who Needs Pictures, he has released eleven studio albums and a Christmas compilation on the Arista Nashville label, with all of his albums certified Gold or higher by the RIAA. He has scored 32 Top 10 singles on the US Billboard Country Airplay chart, 19 of which have reached number 1. He set a new record in 2009 for the most consecutive singles (10) reaching the top spot on that chart. Chester Burton Atkins, known as "Mr. Guitar" and "The Country Gentleman", was an American musician, occasional vocalist, songwriter, and record producer, who along with Owen Bradley and Bob Ferguson, among others, created the country music style that came to be known as the Nashville sound, which expanded country music's appeal to adult pop music fans. He was primarily known as a guitarist. He also played the mandolin, fiddle, banjo, and ukulele. This is a list of notable events in country music that took place in the year 1998. This is a list of notable events in country music that took place in the year 1995. This is a list of notable events in country music that took place in the year 2001. Neotraditional country, also known as new traditional country, is a country music style that emphasizes the instrumental background and a "traditional" country vocal style. Neotraditional country artists often dress in the fashions of the country music scene of the 1940s, 1950s and early 1960s. Some neotraditional artists are sometimes associated with the alternative country movement. Gerald Calvin "Jerry" Douglas is an American resonator guitar and lap steel guitar player and record producer. Red Hot + Country was the follow-up to No Alternative in the Red Hot Series of compilation albums, a series produced to raise awareness and money to fight AIDS/HIV and related health and social issues. This compilation featured music from the classic country and classic rock genres performed by an assortment of seasoned old and new country music artists. The New Nashville Cats is a country album by Mark O'Connor, in conjunction with a variety of other musical artists. O'Connor selected a group of over fifty Nashville musicians, many of whom had worked with him as session musicians. The album was intended to "showcase the instrumental side of the Nashville recording scene". It was awarded two Grammys: Best Country Instrumental Performance for O'Connor, and Best Country Collaboration with Vocals for Vince Gill, Ricky Skaggs, and Steve Wariner's performance in "Restless". This song also charted at #25 on Hot Country Songs in 1991. Nothin' but the Taillights is the seventh studio album by country singer Clint Black. Black co-wrote many of the songs with others and played much of the guitar himself for this album. Neck and Neck is a collaborative album by American guitarist Chet Atkins and British singer-songwriter and guitarist Mark Knopfler, released on October 9, 1990 by Columbia Records. "Poor Boy Blues" was released as a single. Simpatico is an album by Suzy Bogguss and Chet Atkins, released in 1994. Rickie Lee Skaggs, known professionally as Ricky Skaggs, is an American country and bluegrass singer, musician, producer, and composer. He primarily plays mandolin; however, he also plays fiddle, guitar, mandocaster and banjo. John Paul Gimble was an American country musician associated with Western swing. Gimble was considered one of the most important fiddlers in the genre. He was inducted into the Rock and Roll Hall of Fame in 1999 in the early influences category as a member of Bob Wills and His Texas Playboys. Read My Licks is the fifty-sixth studio album by American guitarist Chet Atkins. No More Mr. Nice Guy is the title of an instrumental album released in 1996 by American country music artist Steve Wariner. His final album for Arista Records, it comprises twelve instrumental tracks. No singles were released from it, although "The Brickyard Boogie" was nominated for Best Country Instrumental at the Grammy Awards of 1997. This song features former Pearl River member Derek George, former Boy Howdy member Jeffrey Steele, as well as Bryan White and Bryan Austin. Jimmy Olander, guitarist for Diamond Rio, is featured on the track "Hap Towne Breakdowne". Patrick "Pat" Bergeson is an American guitarist, harmonica player and occasional songwriter. Based in Nashville, he is best known for his live and session work with Chet Atkins, Lyle Lovett, Suzy Bogguss and Les Brers. Down the Old Plank Road: The Nashville Sessions is a 2002 album by The Chieftains. It is a collaboration between the Irish band and many top country music musicians including Ricky Skaggs, Vince Gill, Lyle Lovett, Martina McBride and Alison Krauss.